I also like the colors you chose, DarkAuthor! Reminds me a little bit of a Fairyfloss Norn for some reason, and I love the blue you used for the eyes! Kezune, that is perfect and priceless! Should you ever need some ideas for your revived blog (hurray!) just posting how you go through this drawing process would be really neat. And it never hurts to have some lovely new coloring pages. Now I need to go do some research to make sure I have some decent paper to use my colored pencils on... And to find some time, because these deserve to be colored in! Thanks so much for making all of these. You're awesome! That's not a bad idea! I'll have to put something together the next time I start a coloring page. I'm still working on your honey idea, but things slowed down for the holiday. Will hopefully have it out soon. I had to do a lot. I had to push the upper arms out and away from each other and I lowered then tilted the head back to give a better impression of the norn looking up at the bees. I thought the wider arms would make the norn seem more excited. I also lengthened the torso and turned the planted foot out a little to line up better with the hip. I'm still not happy with the position of the folded leg so I'm going to toy around with that. Maybe moving it out to make the norn seem more like it's bounding around instead of just balancing. Adding backgrounds really complicates things. XD I'm a little bit stuck on what to do for these, particularly baby cheese. I didn't have a plan for a setting for that one in the first place so it's making it a little difficult ot plan out. Add to that, the plane the baby is sitting on is pretty flat so it's a little harder to play with depth. There's also not a giant stump in the way to hide all my mistakes. 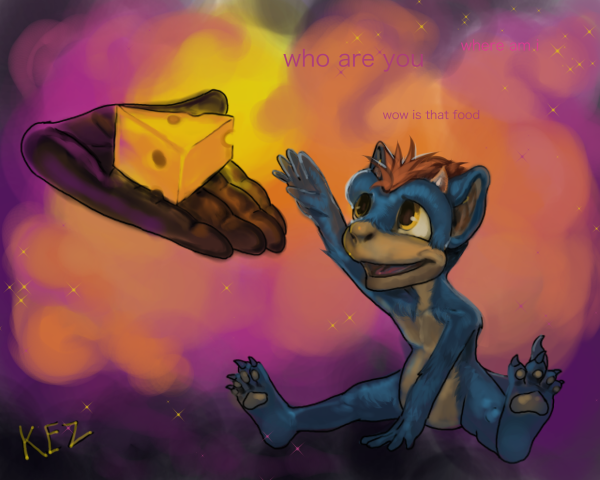 I've added a background to baby cheese, and I'm looking for some input. It isn't supposed to look like any of the incubation areas though this is supposed to be most reminiscent of the Creatures 1 area. It's hard to convey the idea of this baby tumbling out of a cracked egg behind the hand with so little space, but it's an idea. I might move the incubator up, I might just omit it entirely and make the entire wall look like brick. I might even get a screenshot of the Incubator area and just trace. XD I might just leave it as it is. As for the honey/bees idea, this is what I have so far. I pushed the left norn further back and fixed the right leg on the right norn. More work was done to the arms. There are a lot of planes in this one so it's taking longer than I thought. I feel this one really needs a background because otherwise the honey and bees by themselves won't make a lot of sense. It's making this out to be more work than I expected, but I really like the idea of illustrating (and probably exaggerating) some funny norn antics. Anyway, I'm not sure what to do with this beyond the table and bee hives. I might count this piece done once the lines are thrown in or I might throw "Mt. Albia" in the background. These are great! I like the baby cheese background! Hey, if anyone reading has something in your head for this you can't draw, give me a couple of subjects as a prompt. I would love to toss some lineart into the hat here but simple, color-able concepts are not my strong suit. Xan- Wow, that is absolutely stunning! Xan, that's wonderful! Thanks so much for taking the time to color it! I love what you did with the baby's hair and the little thought lines are a great touch. Also love what you did with my signature. And Xan, that is amazing and hilarious, I love the addition of the norn's thoughts. I imagine that might actually be what they are thinking half the time, hah. I absolutely love this topic and how coloring Creatures images has become so popular! I just put away all of my coloring supplies while I was cleaning, and clearly I need to get those out ASAP. Ha! I can see how those backgrounds are being tricky little monsters for you, Kazune. For me personally, backgrounds just help me fill in an area that I would otherwise leave blank. However, I do have it on my list to attempt gradient shading and whatnot... So if you're really stumped, no worries! I almost think the Norn and hand with cheese could work on its own without a background, or just a simple one to show the ground meeting the wall. Loving the beehives one so far! Especially the "Buzz, Buzz or Whatevs" label. Ha! And that is simply amazing, Xan! I feel like we might need another area just to showcase some of these creations. Hurray for these wonderful coloring opportunities!